English - This half term in English our writing will be based on the story of The Enormous Turnip. We will be retelling the story, adapting it and then writing our own version. As well as this, we will be newspaper reports about the Enormous Turnip. Maths - In maths we will be building on our work with shape to successfully find fractions of shape and moving on to looking at fractions of amounts. We will also be consolidating our work with number. Science - Our science work will continue to be focused on Living Things and Their Habitats. We will be identifying the seven life processes and classifying things based on their characteristics. we will also, plan, conduct and evaluate a fair test based on our learning as the weather improves. 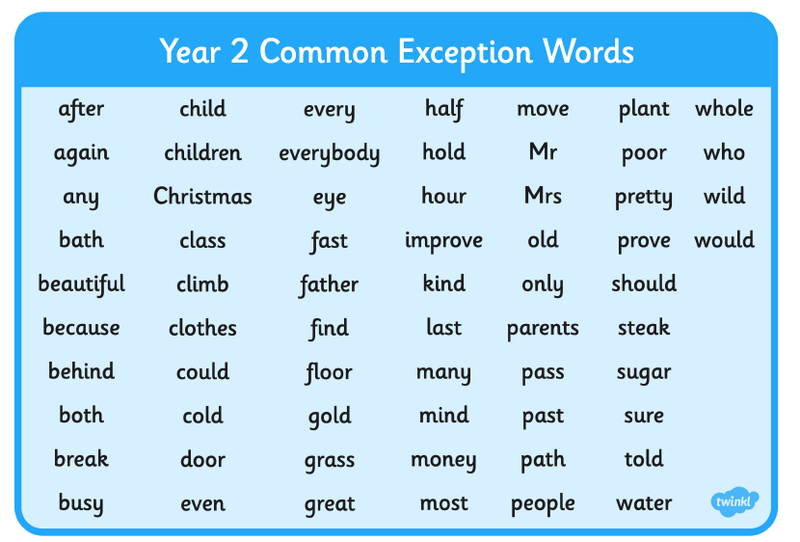 By the end of Year 2 it is excepted that all children should be able to read and spell the following words. We will do lots of practise on these words in class as well. It is really important for the children to know their times tables. Here at Cherry Tree Academy we have found a fun way to learn our times table. Times Table Rockstars! Children can have their own rockstar name, they can listen to rock music as they learn their tables, even play Glastonbury tournaments! All the children have been given usernames and passwords- if your unsure please ask the class teacher. Click the link below to start rocking out! !